That was a good arc, but I am glad everything is starting to come back. Topic: How long do you think Tenjo Tenge will go on for? Halon wrote: i think it will probably end at 17 volumes or 20, i dont think there would be more than that. MetalGravy wrote: so, who's gonna be on the cover for v14? Probably whoever is a "famous" female character at the time. Maybe Shidzuru (before the facial damage) or Makiko or maybe another Maya or Aya cover. Topic: Is Maya in love with Nagi? IMO most figures seem to be totally off when it comes to making the face. But how would he fair against Mits??? EliteF22 wrote: Wow, pv82, 666 posts. I hope nothing bad happens. Email me if u would like some more, Ive gotten alot of practice since the UJSI scans . These images here were greatly reduced to make them fit, and aren't HQ. Topic: Takayanagi Mitsuomi and Maya Natsume??? Topic: How many Vol. 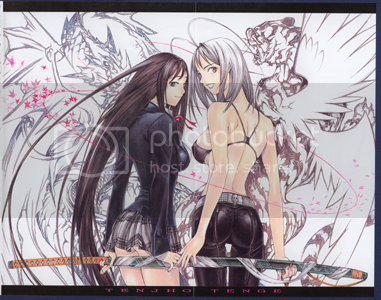 are currently out for Tenjo Tenge? Vol 1 came out about a month ago or so by CMX. Its heavily edited, but if you want your TT legit, then thats the way to go other than buying the original manga. The artwork on the cover of Ch. 83 looks good except for the Aya facial expression, shes coming out looking goofy. Topic: Anyone know this anime? The fact is all the ladies of Ten Ten are hot!!! Topic: Who is your favorite character NOW? Naw, that guy is still trash IMO. Something Dramtic would have to happend like sacrificing his life or something. Mitsoumi, Shohaku , and even Saga Mask seem more likeable than him. Re: Maya vibe ...Sin City?